The popularity of prints signed by famous pilots grows. Chuck Yeager went Mach 1.0 across my living room wall for more than a year before I noticed he had signed the limited-edition print. Another year passed before I read the artist's name: Mike Machat. In the aviation art world, that's like owning a Renoir or a Titian. Machat is among the best in the world. Relatives who gave me the print as a Christmas gift had stumbled into "good art and good signatures," as aviation art gallery owners say. Am I rich? It will take time for the $85 print, now sold out, to appreciate, so ask me in 100 years. I could have as easily been burned by the hottest trend in aviation art today: the limited-edition, signed print. More than 100 galleries offer aviation art around the country. It's a $10-million- to $15-million-per-year business in the United States, gallery owners say. While two thirds of all sales are in the United States, sales are growing in Australia, Canada, Britain, Africa, Japan, and, recently, Germany. Original oil paintings done by the biggest names in aviation art bring from $3,000 to $35,000 each, but the bulk of aviation art sales today come from limited-edition prints — ranging from $30 to $300 — made from those paintings. Those most in demand are signed by aviators who either participated in the historic scene portrayed, or at least flew the type of aircraft featured. Good art, plus good pilot signatures, can and does prove a valuable investment for collectors. The success of the signed print, however, has in the past few years spawned tons of bad art from those hoping to cash in on the trend. Fortunately, most customers are ignoring the bad art, gallery owners say. Now comes the controversy. Is a signed print still art, or is it a collectible signature beneath a very nice painting? Which is more important, the picture or the pilot's signature? It's a chicken-or-the-egg debate. Virginia Bader is generally acknowledged by artists, art publishers, and fellow gallery owners as the one who got the aviation art gallery bandwagon — and the signed print trend — rolling. It wasn't a bandwagon, exactly, more like a Ford Pinto station wagon — with 107,000 miles on it — which served as her first "gallery" and was used to tour air shows in the late 1970s. Formerly a manager of a traditional art gallery in London, she now owns aviation art galleries in Costa Mesa, California, and Alexandria, Virginia. Bader (pronounced *Bahder*) has survived through a keen sense of what buyers want, and what they want is aviation art that appreciates in value over several years. While the top aviation artists paint a wide range of subjects, from Jennys to jets, the more popular for now paint World War II fighters and bombers. Many of the customers driving today's market experienced the war as adults. Bader says World War II buffs relate to their own era best, and many are knowledgeable of its history. At this point in their lives, they are able to afford prints or paintings, she adds. There are other factors guiding that market. Women don't want pictures of aircraft blasting one another from the skies in their homes, says Bader associated John Trueblood, so many of today's newer paintings feature B-17 bombers and other warbirds over placid, pastoral scenes — bomb bay doors closed and guns silent. Look at Robert Taylor's latest print, Winter's Welcome. Topics other than the war are finally gaining in popularity. As older airlines with history and a special identity go out of business — and are replaced with faceless new ones — demand grows for nostalgic airliners such as the Lockheed Constellation. Future trends are also predictable, gallery owners say: As the generations age, Korean War aircraft and, later, those who flew in Vietnam will come into vogue. Wars, airlines. So where's general aviation in all this? It now appears there is an inkling of interest in general aviation aircraft of the 1950s and perhaps the 1960s, but interest in later models is limited to owners willing to commission a painting of their own aircraft, right down to the N number, usually for $1,500 to $2,500. The demand beyond that just isn't there. It takes a publisher $8,000 to produce prints from a painting — much more if signatures are involved — and few artists, galleries, or publishers will accept such a risk for most modern general aviation scenes. Here's how the business works. A print, of course, begins with the artist who creates an oil painting either on commission or speculation and sells it through a show or gallery. Publishers then create prints and market them through their dealer galleries or by direct mail order. Sometimes the artist will self-publish prints and sell them through publishers or galleries or directly to the public through advertisements. Galleries, of course, sell both original oils and prints in stores or, most often, by mail order. Signed, limited-edition prints have become nearly 80 percent of Bader's business, yet she warns buyers more interested in investment than art of "pitfalls." It takes knowledge of the artists, and of art, to purchase wisely. However, the customer who buys only because the print is personally appealing will always be happy with the purchase, she notes. The pitfall is that not all limited-edition prints signed by famous pilots automatically climb in value like a dream stock certificate. Many reputable galleries who hoped to duplicate Bader's success have gone out of business, probably because they lacked her entree with publishers, galleries, artists, and, most importantly, famous aviators. Heritage Aviation Art, a dealer in the Seattle area, recently decided to concentrate efforts on its mail-order business due to low volume of walk- in-customer traffic. The Spitfire Gallery in Frederick, Maryland, stocks mostly prints by William S. Phillips, AOPA 1190184, and Robert Taylor, regarded as the kings of limited-edition-print sales — many of them signed by historically important airmen — but the gallery can't sell them. The owners blame the recession and a lack of art customers in a small town, yet the prints have increased in value while hanging on the gallery wall. The owners even commissioned a painting by well-respected aviation artist Sam Lyons, called Angels over Annapolis, but hundreds of prints remain to be sold. There is, to be sure, money to be made. A print of Phillips' The Giant Begins to Stir, based on the Doolittle Raid on Tokyo, which sold in 1983 for $195, is worth $4,000 today on what gallery owners call the "secondary" market, made up of sales among individuals and sales by individuals back to galleries. Bader put that print project together. "It was the most creative day of my life," Phillips, who is near getting his private certificate, recalls. He, Bader, and a publisher had just come from a lecture at the Smithsonian Institution featuring one of his aviation paintings. The crowd had been enthusiastic. The three talked excitedly over dinner in Arlington, Virginia, just across the Potomac River from Washington, D.C., about what Phillips most wanted to paint next. He mentioned Doolittle's raid. The publisher immediately agreed to publish it, and Bader agreed to get Doolittle and his raiders to sign it. The deal was struck. Thus was born what is now considered the first major airmen-signature print to be published. It is currently on display in the Airmen Memorial Museum, founded by the Air Force Sergeants Association in Suitland, Maryland, south of Washington. The print pictures a B-25 bomber approaching the coast of Japan. The original oil painting was signed by most surviving crewmembers, including the late General Doolittle, whom Bader knew personally. Prints made from the famous painting have fewer signatures, but are signed by Doolittle and a senior surviving crewmember from each aircraft. The painting's value is known only to Phillips and his insurance company, but it is believed to be the most valuable aviation painting in existence. However, a 25 x 75-foot painting by Keith Ferris of B-17s, Fortresses Under Fire, in the National Air and Space Museum, may offer competition for that title. Ferris, along with Frank Wootton (now famous for his World War I aviation scenes) and Nixon Galloway, are considered the pioneers of aviation art. The success of The Giant Begins to Stir would appear to make Phillips enthusiastic about signed prints, but actually, he is concerned about the trend. "I would hate to think my paintings are only vehicles for signatures," he said. "I've had a half-dozen editions sell out with no signatures at all." His art is featured on the cover of two best-selling books, The Cannibal Queen by Stephen Coonts and I Could Never Be So Lucky Again by Jimmy Doolittle. Taylor's Sea King Rescue, produced in 1983 and signed by Britain's Prince Andrew as a charitable venture, sold for $275 and is now worth $4,250, gallery owners say. His Winter's Welcome, an edition of 1,250 prints, sold out in seven days. His prints of Doolittle's Tokyo raiders have quadrupled in value since 1991 to more than $1,250. Taylor admits to being more artist than aviation enthusiast. Born in Bath, England, the self-taught painter got his start with maritime scenes, scoring a particularly big success with a painting of the decommissioned HMS Ark Royal, the last of the Royal Navy's angled-deck carriers. A 1983 limited edition print by Ferris, Little Willie Coming Home, sold for $145 when first published but is estimated by gallery owners today to be worth $4,200, even though it does not have aircrew signatures. It depicts a struggling B-17 just clearing the sand dunes of Holland as it makes its way home on two engines. Those not able to plunk down $30,000 for an original oil find print prices are within reach. The possibility of a good investment is often the rationale many first-time print buyers need to buy something considered a luxury. Here are some ways to determine which prints have the best chance to retain or appreciate in value. Buy only respected artists. Who are they? Many of their names appear in gallery catalogs such as those published by Virginia Bader Fine Arts, Heritage Aviation Art in Bellevue, Washington, The Greenwich Workshop in Trumbull, Connecticut, or Military Gallery in Ojai, California. Making a list of respected artists is a subjective exercise, and many good ones are sure to be overlooked. For example, one person interviewed for this article came up with this list of recognized artists: Phillips, Craig Kodera, Mike Machat ( Yeager Goes Mach 2), Jody Fulks (who shows birds "transforming" into aircraft), James Dietz (famous for World War I aviation scenes, particularly Blackjack's New Scouts), Nicolas Trudgian, Frank Wootton, Ferris, Robert Taylor, former astronaut Alan Bean, Jo Kotula, and John Young. Their work spans World War I to modern-day jet fighters and airliners. There is nothing wrong with those names, except the list completely ignores Galloway, whose Barn Storming (showing a Stearman pulling up near a barn after a crop-dusting run while two boys watch from a hay loft) is one of the most popular prints ever produced. It costs only $30 because it is not a limited edition signed by pilots. (Crop-duster pilots apparently haven't caught on with the public yet.) Galloway is president and Artist Fellow member of the American Society of Aviation Artists. Another artist, Jerry Crandall, publishes his work through his own company, Eagle Editions in Sedona, Arizona, so you won't find his name in the major gallery catalogs. Crandall, by the way, believes talking with the pilots for research and having them sign his World War II prints adds valuable historical perspective to his work. Ferris, who has worked to win legitimacy for aviation art since 1947, and fellow artists Kotula, Bob McCall, R. G. Smith, and Ren Wicks, founded the American Society of Aviation Artists in 1986. (McCall, like Ferris, has painted a mural for the National Air and Space Museum.) Members are selected by their peers on the basis of demonstrated abilities, whether they are world famous or just getting started. There are 140 members. Ferris points out, however, that there are many excellent artists who have decided for one reason or another not to join. The member roster, while impressive, is therefore not an all-inclusive list of the top artists. It's not easy being successful. The work can be extremely hard. A typical day for Phillips starts with painting from 7 a.m. until 2:30 p.m., followed by research on future paintings until 10 p.m. Ferris is known to research historic moments in aviation history down to the minute, even studying that day's weather and light angles. Sam Lyons, who gave up his Historical Hobbies shop in Atlanta in 1984 to become a full-time aviation artist, once attended 30 art and aviation shows a year but has trimmed that grueling schedule to 20. He had a booth at the recent AOPA Expo '93 in Orlando, Florida. He has time to paint "for myself" only three times a year. Currently, Lyons has commissions from individual owners to paint a Cessna 195, a B-24 Liberator bomber, and a Cessna 140. Like Ferris, he gets to fly in modern jet fighters as part of the Air Force Art Program. His painting, Lead Solo, hangs in the Pentagon. "I'm not into pilot signatures so much," Lyons says. "That does make them more collectible. But I want people to buy it because it has my name on it, not the pilot's name. Some of the art is terrible, yet it is signed by the pilot." His Sittin' Pretty, a 600-print edition showing a Piper Cub near a 1940s-era hangar, has proven popular. It was originally commissioned by Sporty's Pilot Shop for use as a catalog cover, but the prints were also sold through Sporty's. Only 150 prints remain in Sporty's inventory. Kristin Hill of Lancaster, Pennsylvania, was educated as a fine artist and has worked out of her studio for 17 years, mostly on commission from individuals. She prefers not to base a painting's value on the signature of a personality or airman. Current projects include World War II aircraft, a modern-day Mooney, a Beech Staggerwing, and golden-era raceplanes. A personal project is a 1928 Travel Air flying over a school with excited children racing outside to see the aircraft. She is also working on what she hopes will become an AOPA Air Safety Foundation Christmas card in 1994, a biplane over a snow scene. Her fees range from $2,500 to $7,500 per painting, depending on complexity. "I don't like to see the aviation art market driven by dollars," she said. "Artwork should not sell because of the signatures." She offers lightplane pilots hope that general aviation aircraft may yet become popular. "People are becoming interested in the general aviation aircraft of the 1950s and '60s," she said. These include aircraft no longer produced and seldom seen, outside of antique air shows. "Other nostalgic aircraft of the 1920s, 1930s, and 1940s have been in demand for some time." The 1950s and 1960s have strong competition for now. As Kathleen Weber of Heritage Aviation Art notes, the 50-year anniversary of the end of World War II is coming. It may keep art depicting that era at the forefront of sales for some time. Smart consumers will follow Bader's first rule of collecting: Buy it because you like it, whether it goes up in value or not. For more information, contact: Military Gallery, 821A East Ojai Avenue, Ojai, California 93023, 805/640-0057; Lyons' Studio, 4600 Kings Crossing Drive, Kennesaw, Georgia 30144, 404/928-8050; Virginia Bader Fine Arts, 355 Bristol Street, Costa Mesa, California 92626, 800/328-5826, or 703/548-4440 in Alexandria, Virginia; Heritage Aviation Art, 12819 S.E. 38th Street, Suite 211, Bellevue, Washington 98006, 800/331-9044; Kristin Hill Studio, 424 N. Duke Street, Lancaster, Pennsylvania 17603, 717/394- 9419; and Spitfire Gallery, Frederick Municipal Airport, Frederick, Maryland 21701, 301/694-5555. What Is Good Aviation Art? Telling the artists from the opportunists. Keith Ferris has a rule of thumb for determining good art: "If it can be handled by a photographer, I'm not interested in spending my time doing the same thing with paint." His second rule of thumb: Look at the painting from across a room. "If you can tell at a glance what is going on, what it is and what it is doing, then it is pretty good art," Ferris said. Another important test is to look at the shadows on an aircraft. Some artists will blacken the shadows, either to save time or eliminate a difficult portion of their jobs. "Airplanes are like a big mirror," Ferris said. "They reflect the surrounding environment in their surfaces." Aircraft are suspended in space, illuminated not only by direct light, but by reflected light as well, he notes. "I try to convey what it feels like to fly," said the artist, whose own dreams of becoming a fighter pilot were shattered when allergies kept him out of the Air Force. His art, however, got him into the cockpit as a civilian. He has logged 300 hours as a passenger in F-100s, F-105s, F-106s, F-4s, F-15s, and F-16s in the past 33 years as a civilian artist in the Air Force Art Program, designed to document the Air Force mission. "I try to document history. It is something that comes from the heart," he said. 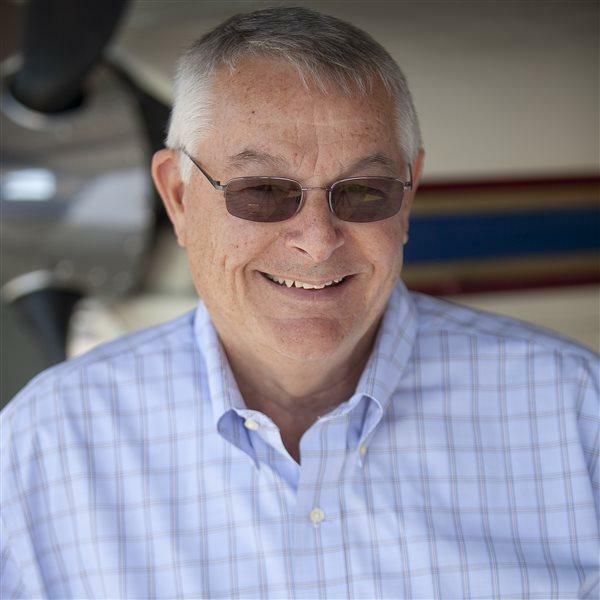 His past clients include AOPA. Artists with cameras use the general aviation aircraft simply as a tool that offers a unique perspective. If it's the view that entices people to fly, their photos should help swell the pilot ranks. Camera buffs will ask, "What camera? What film? What exposure?" It makes little difference. Even if we knew, few of us could duplicate their special talent. William Garnett of Napa, California, pioneered such aerial artistry. Born in 1916, he continues to fly and photograph from his Cessna 170B. Talk about respectability — he has been featured in eight shows at the Museum of Modern Art in New York. His photographs are in the Metropolitan Museum of Art in New York and the Smithsonian Institution in Washington, D.C., where he was featured in a show at the National Air and Space Museum in 1979. He pilots for himself when photographing, sometimes banking the aircraft 90 degrees momentarily to get the right perspective. His book The Extraordinary Landscape, featuring aerial photographs over the United States, was published in 1982 by the New York Graphic Society and publisher Little, Brown. A new book of black and white photographs, William Garnett: Aerial Photographs, will be published in September by the University of California Press in Berkeley, California. He taught photography at the University of California at Berkeley, in the College of Environmental Design, for 16 years. Garnett is quick to claim, even after 20 years, Barrie Rokeach, AOPA 627678, as his former student. The commercial, instrument-rated pilot worked his way through college at a Long Beach, California, airport, where he took advantage of employee discounts on flying lessons. He now has 1,500 hours.